1. Clean the prawns and de-vein them. 2. Marinate the prawns with lemon juice,black pepper, salt and parsley. 3. In a pan heat the cooking oil and add the marinated prawns and cook for a 4-5 minutes. 4. Now add the tomatoes and simmer. 5. When they are almost done, stir in the palm oil and cook for a minute. 6. Finally add the coconut milk and simmer for a minute until done. Omg, wat a fantastic curry,seriously quite a new dish for me. 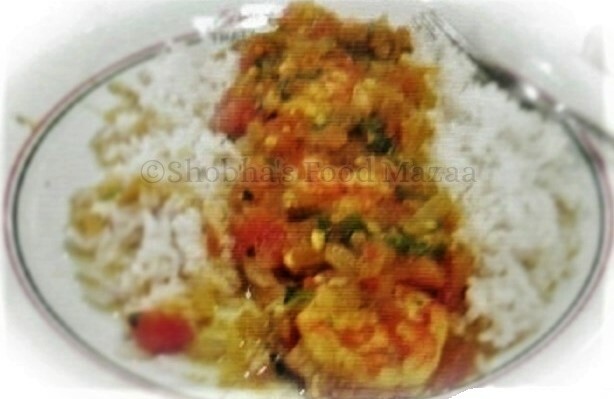 Delicious prawn curry, perfect meal.